Build Design Style ~ “Second French Empire” Mansard (Built 1882). Louis-Napoléon Bonaparte (20 April 1808 – 9 January 1873) was the first President of the French Republic and, as Napoleon III, the ruler of the Second French Empire. He was the nephew and heir of Napoleon I. Elected President in France’s first ever popular vote in 1848, he initiated a coup d’état in 1851, before ascending the throne as Napoleon III on 2 December 1852, the forty-eighth anniversary of Napoleon I’s coronation. He ruled as Emperor of the French until 4 September 1870. He holds the distinction of being both the first titular president and the last monarch of France. 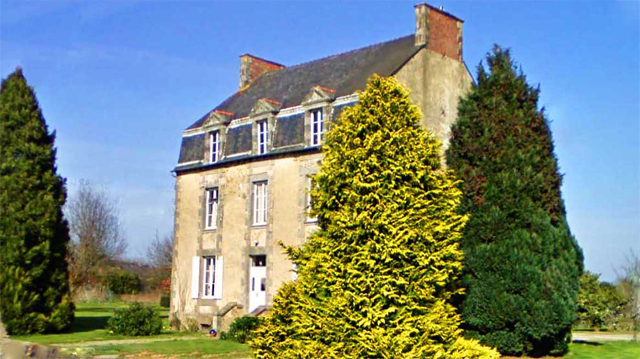 La Maison Manoir, by structure, complete with it’s distinctive Mansard Roof and incorporated Dormer Windows, front and rear, was built to reflect the exuberant “Paris / Versailles style”, which, in Vogue, was adopted by wealthy ostentatious property owners at that time. A visual and tangible status reflecting power and success for the few that could afford such luxury within their community. By 1900 the revealed decadent architecture, that is today’s Paris, post-reconstruction became and continues to be, as one of the finest and romantic Capital Cities, the envy of the world. Today La Maison Manoir can boast the status of being a by-product of the Second French Empire Paris re-birth which, although no Chateau, still holds a significant place in French architectural history. La Maison Manoir æsthetically represents “Grandeur” through a relatively simple but very era-specific design. 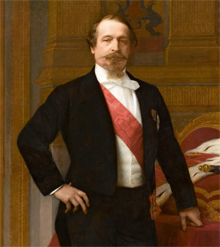 Napoleon III began his regime by launching a series of enormous public works projects in Paris, hiring tens of thousands of workers to improve the sanitation, water supply and traffic circulation of the city. To direct this task, he named a new Prefect of the Seine, Georges Eugene Haussmann, and gave him extraordinary powers to rebuild the centre of the city. He installed a large map of Paris in a central position in his office, and he and Haussmann planned the new Paris. The population of Paris had doubled since 1815, with no increase in its area. To accommodate the growing population and those who would be forced from the centre by the new boulevards and squares Napoleon III planned to build, he issued a decree annexing twelve surrounding communes, and increasing the number of Communes from twelve to twenty, which enlarged the city to its modern boundaries. For the nearly two decades of Napoleon III’s reign, and for a decade afterwards, most of Paris was an enormous construction site. To bring fresh water to the city, his hydraulic engineer, Eugène Belgrand, built a new aqueduct to bring clean water from the Vanne River in Champagne, and a new huge reservoir near the future Parc Montsouris. These two works increased the water supply of Paris from 87,000 to 400,000 cubic meters of water a day. He laid hundreds of kilometres of pipes to distribute the water throughout the city, and built a second network, using the less-clean water from the Ourq and the Seine, to wash the streets and water the new park and gardens. He completely rebuilt the Paris sewers, and installed miles of pipes to distribute gas for thousands of new street-lights along the Paris streets. Beginning in 1854, In the center of the city, Haussmann’s workers tore down hundreds of old buildings and cut eighty kilometers of new avenues, connecting the central points of the city. Buildings along these avenues were required to be the same height and in a similar style, and to be faced with cream-coloured stone, creating the signature look of Paris boulevards. Napoleon III’s new parks were inspired by his memories of the parks in London, especially Hyde Park, where he had strolled and promenaded in a carriage while in exile; but he wanted to build on a much larger scale. Working with Haussmann and Jean-Charles Alphand, the engineer who headed the new Service of Promenades and Plantations, he laid out a plan for four major parks at the cardinal points of the compass around the city. Thousands of workers and gardeners began to dig lakes, build cascades, plant lawns, flowerbeds and trees. construct chalets and grottoes. Napoleon III created the Bois de Boulogne (1852-1858) to the west of Paris: the Bois de Vincennes (1860-1865) to the east; the Parc des Buttes-Chaumont (1865-1867) to the north, and Parc Montsouris (1865-1878) to the south. In addition to building the four large parks, Napoleon had the city’s older parks, including Parc Monceau, formerly owned by the Orleans family, and the Jardin du Luxembourg, refurbished and replanted. He also created some twenty small parks and gardens in the neighbourhoods, as miniature versions of his large parks. Alphand termed this small parks “Green and flowering salons.” The intention of Napoleon’s plan was to have one park in each of the eighty neighbourhoods of Paris, so that no one was more than a ten minute’s walk from such a park. The parks were an immediate success with all classes of Parisians. 1860 pocket plan or case map of Paris, France: by the French map publisher Andriveau-Goujon. 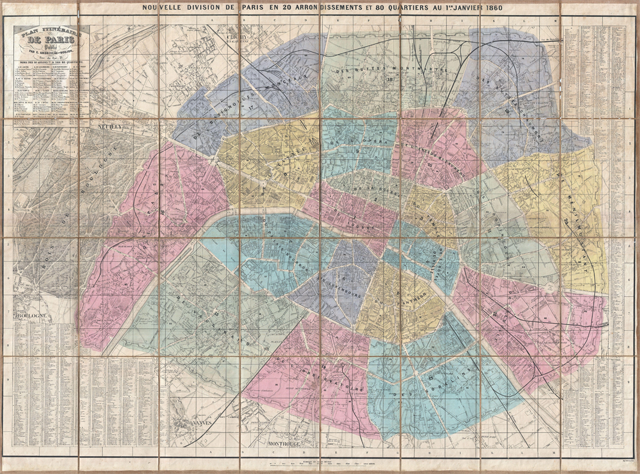 Covers central Paris as it appeared following the city’s historic 1860 expansion from 12 to 20 Arrondissements. Detailed to the level of individual buildings with fortifications, palaces, churches, roads, rail-roads, rivers, forests and gardens noted. Shows the elaborate forest gardens surrounding Paris, in particular the Bois de Boulogne.